"Today cricket is a craze because of the television. [Apne zamane main khali ek chhota transistor hua karta tha (In our times there used to be only a small transistor]. So there was hardly any reaction." Former India captain Nari Contractor describing the initial public reaction to one of the greatest moments in the country's cricketing history. Memories of India's win against Australia in the third Test at Perth are still afresh. And so are images of the celebrations that followed. The win, India's 16th over Australia in 72 Tests, has been hailed by almost everyone as one of the greatest ever in the country's cricketing history. A perfect case of history being made, and, more importantly, registered. However, there are instances of history being made but not registered. They don't get the recognition they deserves and only remain faint memory, especially among those who are a party to it. India's first ever Test win over Australia in December 1959 at the Green Park ground, in Kanpur, is probably one such historic moment that remains consigned to the record books. And since we are also guilty of similar reluctance and we take the opportunity to apologise for the same. But now that one is at the venue where the said history was made, it's time to make amends. It was the second Test in the five-match series, the Richie Benaud-led Australians 1-0 up, having already won the opening Test at the Ferozshah Kotla. 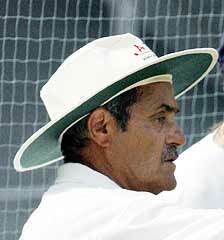 "That was the first match to be played on a turf wicket," remembers Nari Contractor, a member of the team. "The wicket was peculiar because in the morning the wicket looked brown when it was damp and, as the day passed, it would slowly turn whitish." The initial description over, the talk inevitably veers towards Jasubhai Patel, the off-spinner whose 14 wickets were instrumental in ensuring India's win. "In their first innings, Australia had reached 71 without loss when their opener Gavin Stevens drove straight and Jasu took a one-handed catch to dismiss him. From that moment onwards, wickets started falling regularly," recounts Contractor. "Jasu used to cut the ball at a medium pace. And because of the dampness in the wicket he got some advantage." Chandu Borde [Images], another member of that team, concurs: "There was some dew, the top became quite soft and though Jasu normally bowled off spin, in that match he bowled cutters quite effectively. He definitely made good use of the wicket." However, despite the Gujarat spinner's impressive figures of 9/69 in the first innings, Australia still took a 67-run lead -- India having scored just 152 after winning the toss and batting first. Needing to put a decent total on board in the second innings to have any chance, India needed someone to play the sheet anchor's role and it was opener Contractor who took up the responsibility. "In the second innings, I got 74, and that I consider as one of my best innings," says Contractor with pride. The innings ended in a strange manner and this is how the man who got dismissed describes the incident. "I was caught rather awkwardly off a pull. Neil Harvey tried to duck but the ball got caught in between his legs. It was painful," admits Contractor. However, he had done his job. India made 291 in their second stay and Australia were set a victory target of 225. Then the first innings hero struck again. "Jasu bowled particularly well from one end and Polly (Umrigar) kept a good line and length from the other end," recalls Borde. But so confident were the Australians about winning that they had become complacent. "I remember some of their players had not come at all and were enjoying their time in the swimming pool. But frantic calls were made even as wickets kept falling," adds Borde. "I would say Jasu's five-wicket haul in the second innings was more crucial than the nine-wicket haul in the first." Contractor agrees. "It was a great achievement as it was one of the best Aussie line-ups ever, led by Benaud. 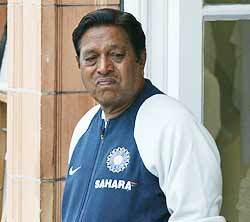 But they just couldn't master Jasu in that match," he recalls. Australia were dismissed for just 105 as Patel claimed 5/55 and Umrigar 4/27. The former's performance was all the more remarkable considering he had not played in the opening match and had only 10 wickets to his name in four Tests after his debut four years earlier (1955). Patel took 19 wickets in that series (which Australia eventually won 2-1), five more in the two Tests at Chennai (2/84) and Eden Gardens (3/ 119), the last one happened to be the final Test of his short seven-Test career. Needless to say, India's victory was special; especially because it had taken 12 years -- the first Test between the two countries was played on November 28, 1947 at Brisbane -- and 10 Tests and India lost seven of the previous nine Tests -- and came at a time when Indian cricket was still at a nascent stage (or do we say fledgling?). And though celebrations were nowhere close to the delirium that happens in contemporary Indian cricket, there were still a few moments to cherish. "We're jubilant after the win. We had a victory lap and poor Bapu (Nadkarni) got hit by a stone amidst the celebrations," recollects Borde. "We were later given a party in one of the industrialists' place and promised a 1000 rupees bakshis each," he says with a chuckle. "It is yet to come. Imagine what the interest would amount to now?" We can't help but empathise with him. It's nearly fifty years now since that dramatic win happened. But even as you walk across the Green Park ground, you can't help but wonder about certain incidents that are inherent to a particular venue; incidents which set it apart from others and define that particular ground. India's first-ever Test win over Australia is one such. It will be etched in the history of the Green Park ground for eternity. India drew with Australia in the second Test of the five-match series (though the latter won 3-1) in November 1969 and beat Australia again in October 1979. To this day Australia are yet to beat India in a Test match at the Green Park. And that is a record no other ground in the world can boast of!